Posted by janina on October 5, 2009 at 9:23 pm. Several times this year I’ve expected to come across a fig tree loaded with fruit ready for picking and preserving, but each time I’ve been met with an almost bare tree or painfully under-ripe fruit, and come away with just a few handfuls. This is a serious problem for me, because I have a deep and unending love for fresh figs and the many things you can do with them. There is no other jam I love more than fig jam (quince paste is a paste not a jam, so I feel okay saying this…), and there is no fruit I would rather have fresh than figs. 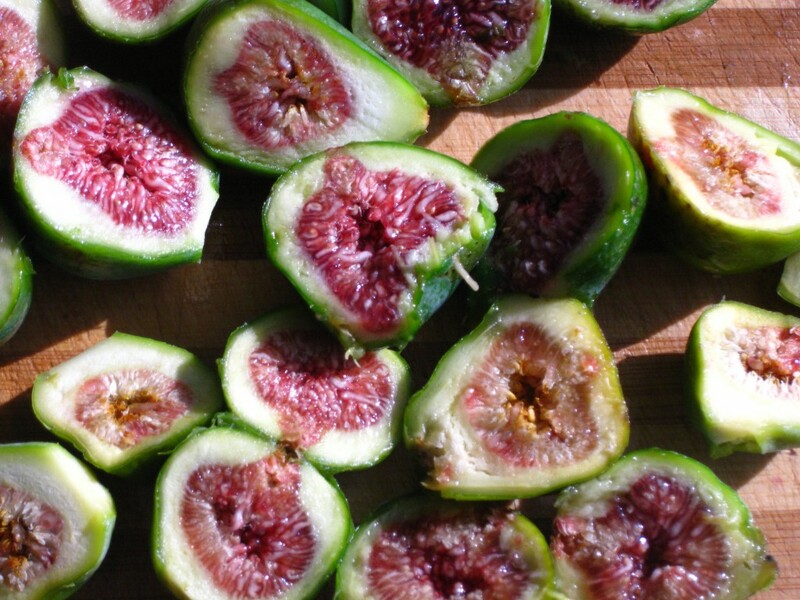 When you get the perfect, gooey, slightly firm fig… there is just nothing like it. So when I have only a handful, I end up hoarding them, foolishly and indecisively, until one day I open the refrigerator and they are dried out, lonely, and about to mold. This week I got a handful of green figs from my grandmother’s tree and determined not to let this happen. After reading Edward Schneider’s article about the Tarte Tartin, I couldn’t get the idea of caramelized figs out of my mind. 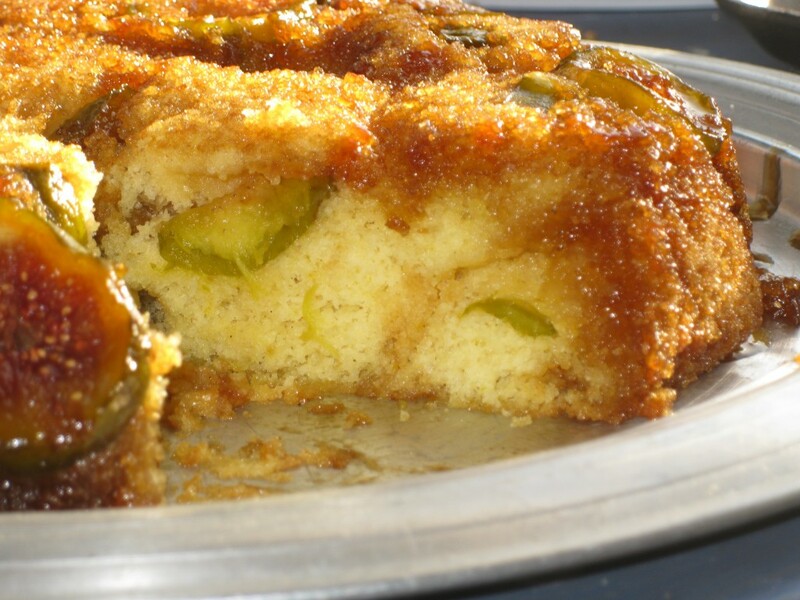 Then I saw Nate’s post about the Boy Bait Cake, and suddenly it just all came together: Fig Upside Down (or Skillet) Cake. I have never made an upside down cake until today, and as I’ve mentioned before I’m really not a baker, but I love my iron skillet and I was determined to caramelize these figs, so I went for it. The result was unparalleled, delicious, and one more thing to add to my “things I love to do with figs” list. 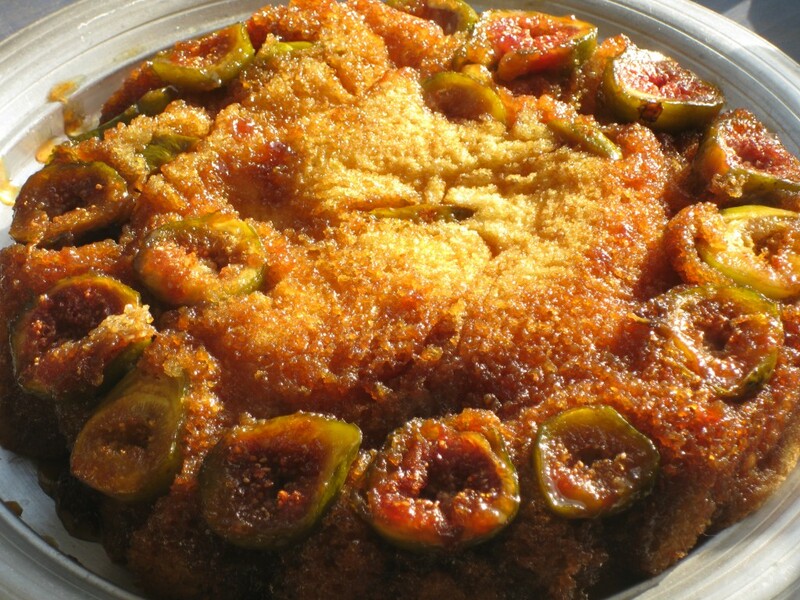 The basic process is to create a syrup for the figs to sit in then pour a batter on top and bake. 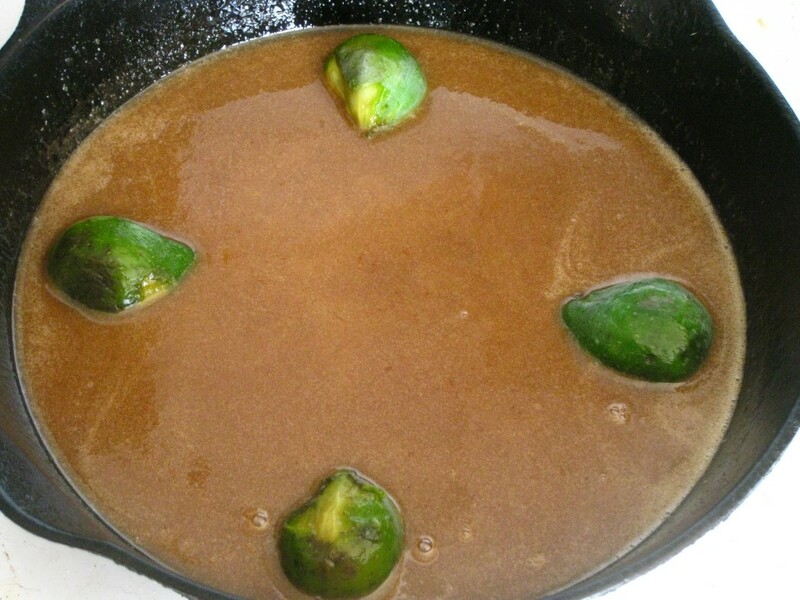 The syrup cooks the figs until they candy, and caramelizes as it cools after you remove it from the pan. This results in a delicious, moist cake with a slightly chewy and very figgy top. This adaptation includes some of my favorite fig compliments, plus sea salt (I love salt in a caramel!) and a little extra instruction in places where the anti-baker in me needed them. I found this recipe especially fun because you get to use a lot of bowls- a set of 4 nesting bowels is perfect. 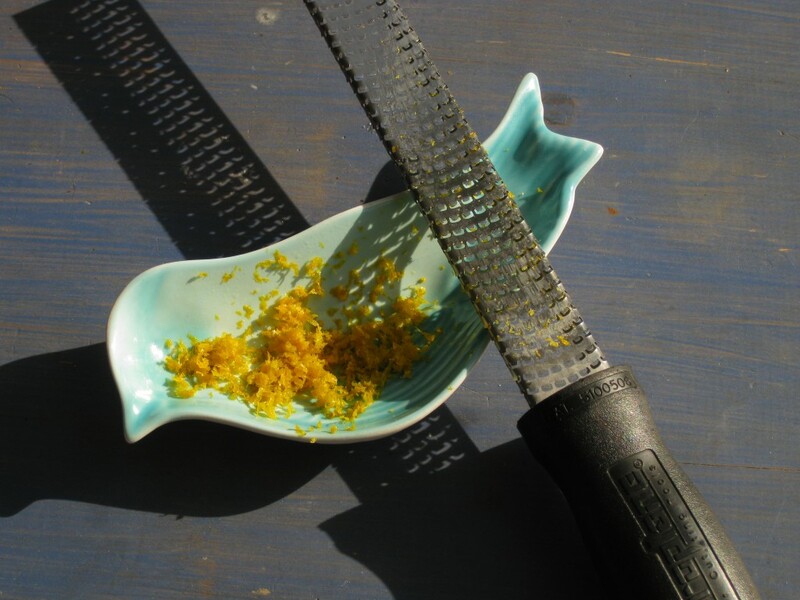 juice the orange into the iron skillet and add 1/2 cup of dark brown sugar and a pinch of sea salt (a pinch is less than a 1/8th of a teaspoon, just sprinkle a little in the pan). Heat on low until the sugar is well dissolved. remove the tough tips and cut the figs in half. 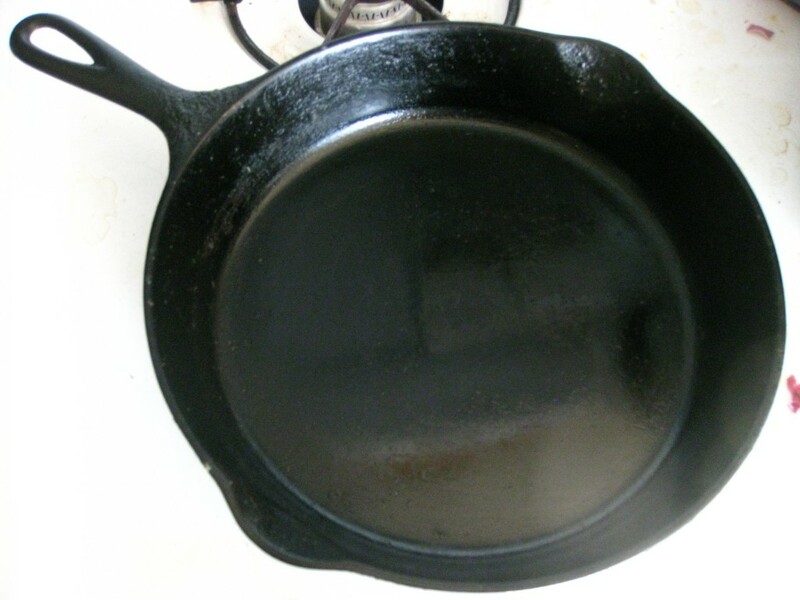 Place them flat side down in the skillet with the narrow tips pointing inward. 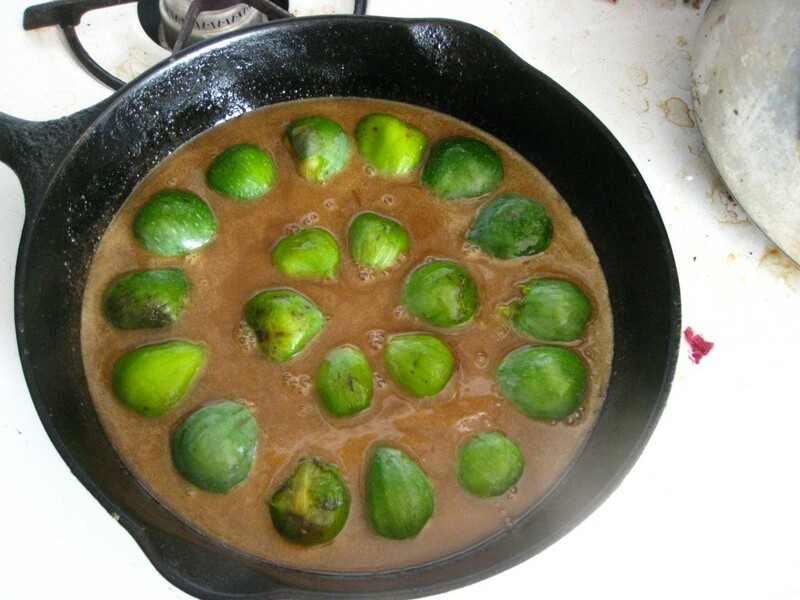 If you don’t have an abundance of figs, start on opposite sides until you can see how it will fill out the pan. If you have enough, you can place a second ring on the inside, but they might move around as you pour in the batter later. take the largest and smallest bowl, separate the egg whites into the largest, and the yolks into the smallest. beat the egg whites until stiff, but not dry. This means you want to see peaks beginning to form, but smaller rounded peaks instead of stiff, tall thin peaks. “Peaks” are what form when you turn off the beaters and lift them out of the egg whites. now you will fold in the rest of the ingredients into the egg whites one at a time. Folding basically means you are very very gently and slowly adding something to something else, usually the something else has air beat into it that you are trying not to deflate. So as you do this, try your best to be patient, and gentle. Pay less attention to how even it is, and more attention to how careful you can be. By the time you get to the flour it will be more batter like and less fragile, so you will be able to stir it a little more thoroughly at the end. fold in the sugar 1 Tablespoon at a time by sprinkling it over the egg whites and gently turning it over on itself. place the skillet in the oven for about 30 minutes, or until the top is slightly browned and the center springs back when touched gently. I got a little nervous as this was making because I could smell the sugars caramelizing. When I checked on it, there was a lot of chaos going on around the edges of the skillet, but that seems to be perfectly normal. Don’t fret! It will all look lovely at the end. 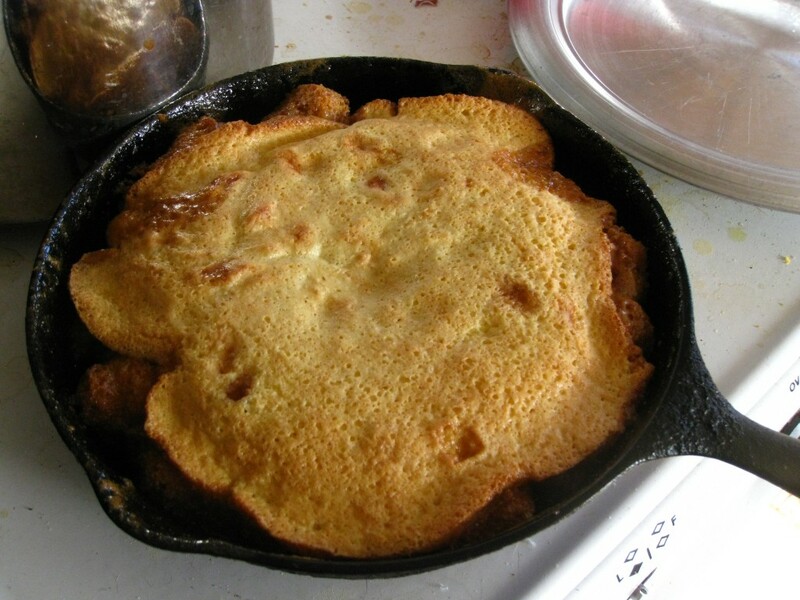 immediate remove from the oven and flip it over onto a plate- to do this, use oven mitts and place the plate on top of the skillet, holding it together, then flip it over and set it down. Let the skillet rest for a couple minutes before removing it to help coat the cake. 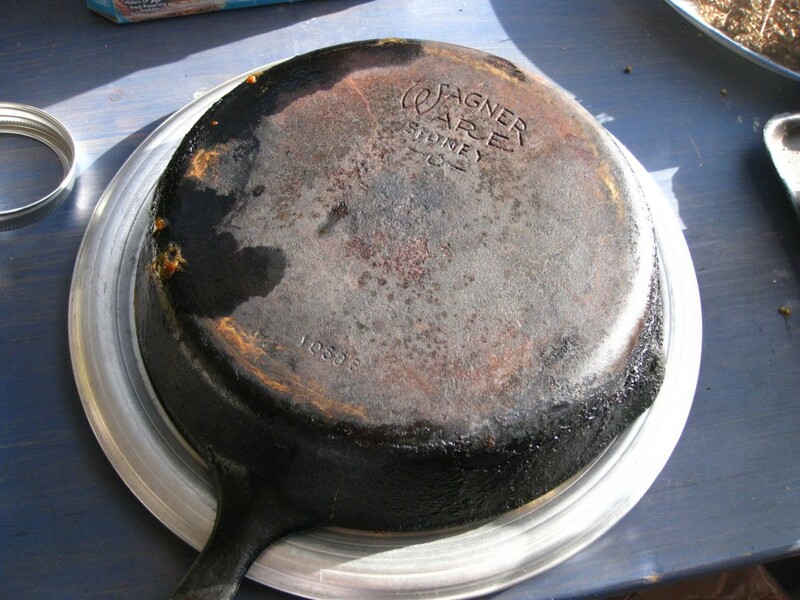 Remove the pan and serve!